Mini hotel "Golden Lion" is located in the center of the city. Zvenigorodka, Cherkasy region. The hotel has 8 rooms of different categories. The rooms are equipped with air conditioning and a flat-screen TV. Wired internet is available in the hotel. Guests can eat at the hotel restaurant, there are also shops and a market nearby. The menu of the restaurant includes European and Ukrainian cuisine. For the car there is a guarded parking lot. For the comfort of the hotel guests, there is a 24-hour water supply and independent heating. Mini hotel "Golden Lion" is located 12 kilometers from the ski resort of Vodyaniki, about 20 minutes drive. 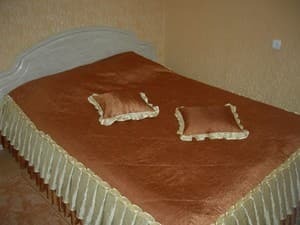 Description of the room: The room is equipped with a single bed. Description of the room: The room has a large bed, a separate bathroom, a shower with cold and hot water, a flat-screen TV. Description of the room: Comfortable room with three single beds. 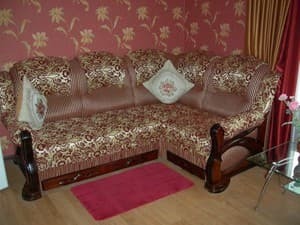 Description of the room: Cozy room with a double sofa bed. Description of the room: Spacious room with a large double bed. The room has a separate bathroom with 24 hour water, TV, air conditioning, refrigerator. There is the possibility of placing an extra seat. Я знімав номер люкс. Нічого не сподобалось. В номерах не приємний запах прілого, старого. Дуже темний номер. Ліжко було зламане, один з телевізорів не показував. Сніданків не має. Чистенько, спокойно,рядом ресторан (даже два). Нормальный,скромненький отель для такого городка. Адекватная цена. Холодильник был не вымыт, в душе не стекала вода , и в последний день утром отключили горячую воду( поэтому не могли принять душ, как следует).Еще тапочки, халат, гель для душа и мыло были на одну особу( хоть номер люкс двохместный). Children under 5 years without extra beds are accommodated free of charge. Guests can eat at the hotel restaurant, there are also shops and a market nearby. 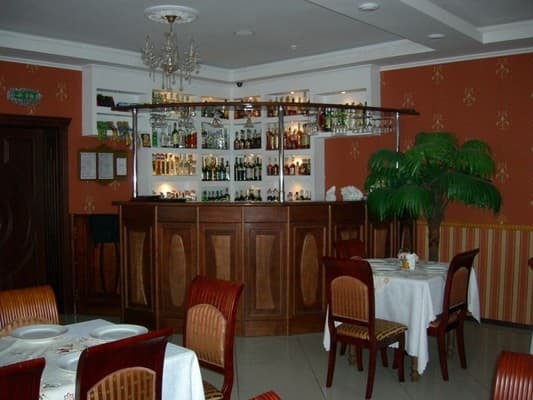 The menu of the restaurant includes European and Ukrainian cuisine. 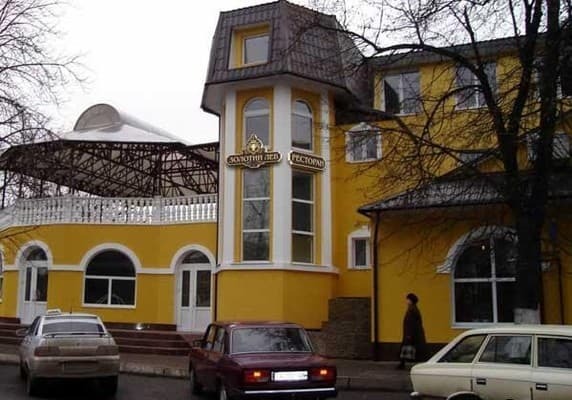 Hotel "Golden Lion" is located in the center of Zvenigorodka. The complex is located 12 kilometers from the ski resort of Vodyaniki, about 20 minutes drive.